When Kathleen (Oglesby) McDonald woke up in the hospital February 16, 2015, she had no idea of the extent of her injuries. “Well at least we don’t have to go to Florida anymore,” joked her then-boyfriend, now-husband Kory McDonald, trying to make light of the situation. The couple had planned a spring break trip with some friends, but Kory didn’t really want to go. “What do you mean?” Kathleen asked. She didn’t realize how different her life was about to be. Earlier that day, Kathleen had been out with her younger sister, Olivia, and friends, enjoying a fresh snowfall that had closed campus for the day. She and Olivia took off down the hill on a sled. Though Kathleen doesn’t remember much, they lost control of the sled and crashed into a tree. That crash changed the course of Kathleen’s life. With a crack in her spine, several shattered vertebrae, five broken ribs and a fractured collarbone and shoulder blade, Kathleen spent the next three weeks in the hospital before going to Rusk Rehabilitation Center and then home. But returning home didn’t mean life returned to normal. 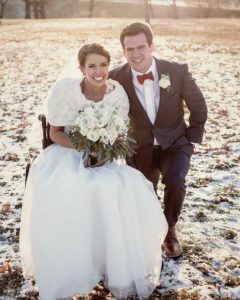 Now in a wheelchair, Kathleen had to relearn everything from showering and getting dressed to getting around. Suddenly she found herself having to ask for help, and at first, that got her down. Slowly, however, life began to return to a new normal, and Kathleen returned to her positive outlook on like. The following semester, fall 2016, Kathleen was able to resume classes at the University of Missouri, where she had originally started as a journalism major before switching to pre-nursing. Both of her parents are nurse anesthetists, so Kathleen waivered a bit on her desire to become a nurse. Her accident solidified her decision. Now, Kathleen is just three months away from graduating from the Sinclair School of Nursing’s accelerated BSN program. She has successfully navigated the intense program with the added challenge of a wheelchair and has loved every step of it. Some things do present an extra challenge. Lifting heavy patients is nearly impossible and some things are simply out of her reach. But Kathleen has learned to navigate that. After graduation this July, Kathleen sees herself working in a clinic and she hopes to work in pediatrics. With graduation just around the corner, she took another exciting step earlier this winter. On New Year’s Eve, she married Kory and became Kathleen McDonald. After a honeymoon in Jamaica, the two returned to Columbia and came back to their schoolwork. Kory is a physical therapy student in the School of Health Professions.